Black raspberries (Rubus occidentalis) are one of my very favorite foods. This year we have a bumper crop–everywhere I go, the black raspberries seem to be growing! I have been harvesting at several spots, including in my own yard. Black raspberries have a very unique flavor–slightly sweet, with a hint of floral undertones, and tart, rich. So delicious. They grow on canes that get up to three feet tall (taller if they grow up trees) with tons of thorns. The stems of the canes are typically either a dark purple (indicating an older vine) or light green. Both kinds of stems have a white powdery layer (which allows you to clearly distinguish them from black berries or other red raspberries. Black raspberries come into season in July in most of the Midwest, Great Lakes, and Mid-Atlantic states. This year, we are a little later than previous years (usually 4th of July is around when we really start harvesting them). The season lasts only a few short weeks (and they are followed by blackberries, so you can have fresh berries for quite a while if you know where to pick!). Generally, if you want them you have to pick them yourself because like most wild foods, they aren’t commercially available. I have seen them occasionally at the Farmer’s Market, however. We’ve had a lot of rain and cold spring weather (and a dismal harvest last year) and I think all of these things contributed to the bounty of berries that we have this year. Here are some of the bushes I have been picking–you can see how they are just loaded with fruit. 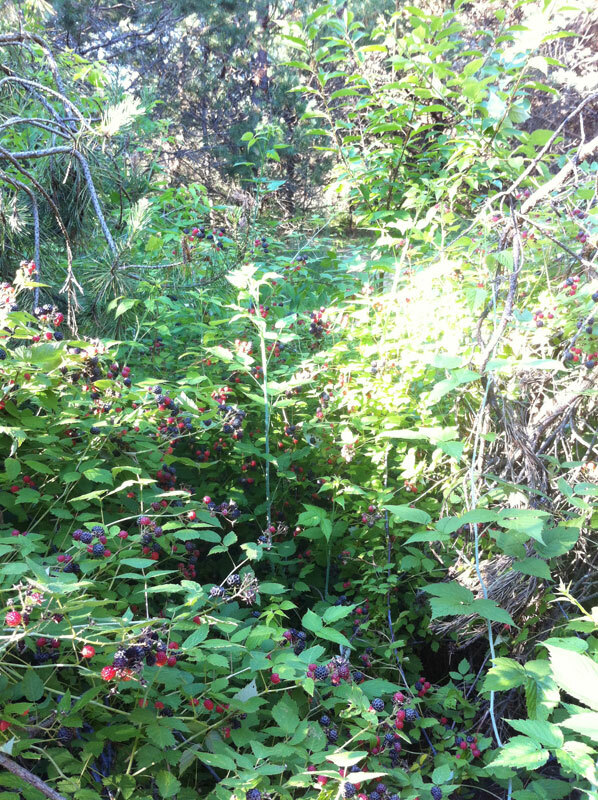 To find black raspberries, you want to look to the edges, the places where fields meet forests. They like dappled sunlight. They won’t fruit if they are too deep in the forest. The berries will dry up if they are in too much sun. I’ve found them in both hardwood forests and pine forests–and in my front yard :). You an identify them year round by looking at the cane stems. 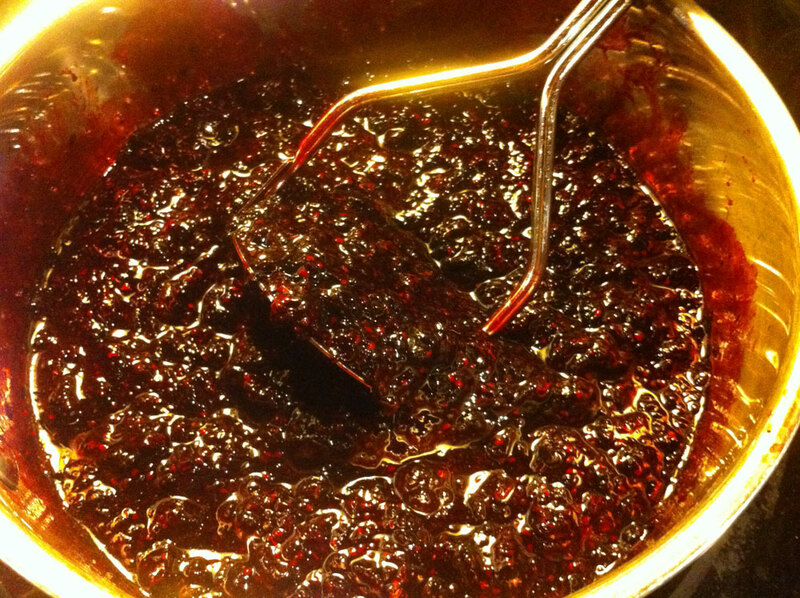 Black raspberry fruit makes stunning jam, syrup, sauce, fruit leather, dried berries, and so much more. They freeze ok, but I find that they get too tart and lose their sweetness with freezing, so I prefer other methods of preservation. I use canning recipes from the Ball Book of Home Preserving, especially, the raspberry jam and sauce. I’ve also dried some this year, and they are pretty good. 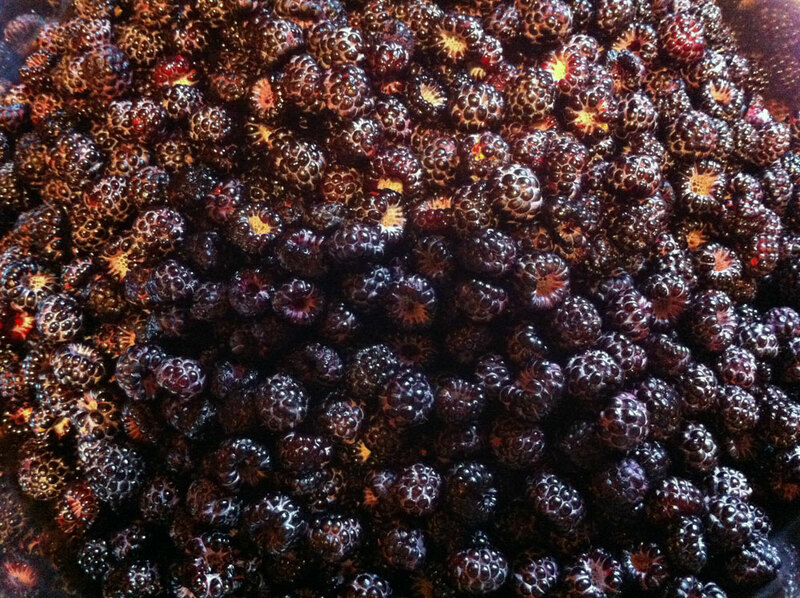 Recent harvest of black raspberry! In addition to the fruit, the leaves make a fine herbal remedy. Matthew Wood indicates that Raspberry leaf is a mild astringent, good as a tonic for relaxed tissue. It was used by the native Americans used them for pregnancy, preventing morning sickness, preventing miscarriage, and aiding in healthy births. Its also used for diarrhea (pg 308- 309, The Earthwise Herbal: A Complete Guide to New World Herbs). Black Raspberry has been one of my sacred herbs for quite some time. Its one of the fruits that I find “welcoming” when I enter new wild areas. Despite their thorny qualities, which my friend and herbalist Jim McDonald discusses in detail, the plant is a nice one, telling you to be cautious but come closer for some fruit. Here is a recipe that another good friend recently taught me, which is making fruit leather. 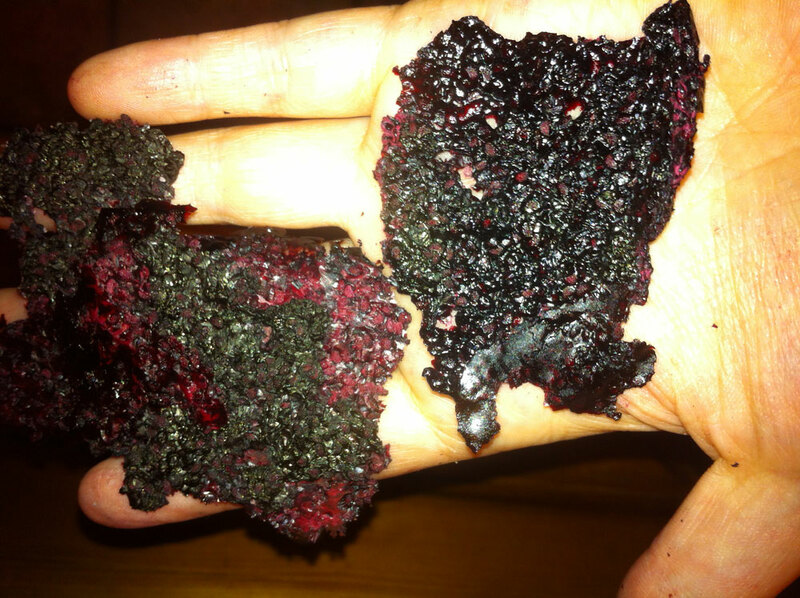 Fruit leather can be made with all sorts of berries and they keep a really long time. Fruit leather is like a fruit rollup. You can choose if you want a more crunchy fruit leather (by keeping the whole fruit, including the seeds) or a soft leather (by straining out the seeds). The recipe is simple: put your raspberries on the stove on low and mash them up. As soon as you start to see steam coming off of them, pull them off the heat and add in the honey. If you want to strain your berries, cook them at least 10 min, then strain, then add honey. You can add as much honey as you want, but the more you add, the stickier your fruit leather gets. I found 1/2 cup to about 6 cups berries (unstained) gives just a hint of sweetness and flexibility to the fruit leather. 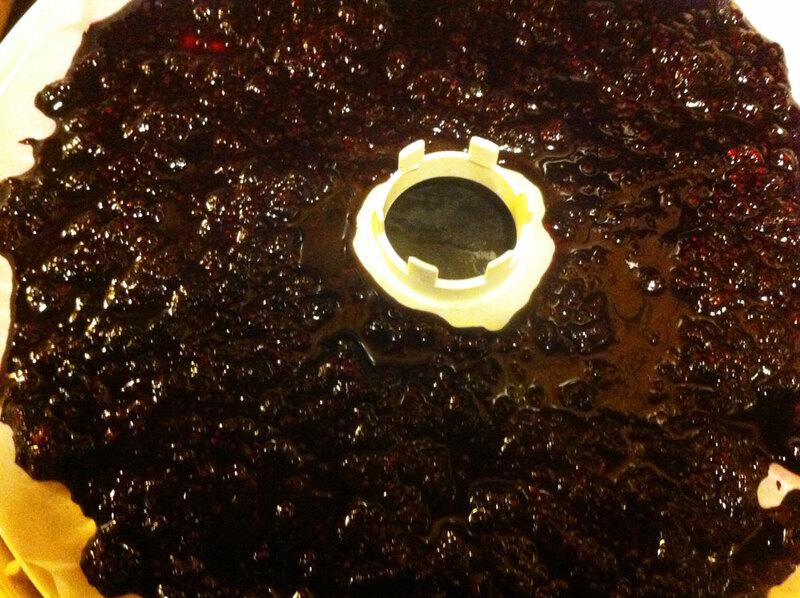 After honey is added, wait till its cooled down about 5 minutes, then put it in a thin layer on your dehydrator. Dehydrate about 12-15 hours on the fruit setting till its leathery. Store in airtight jars (I stored mine in canning jars). This is a great trail food! Black Raspberries washed and prepped! PS: My posts will probably be sporadic in the next few months. 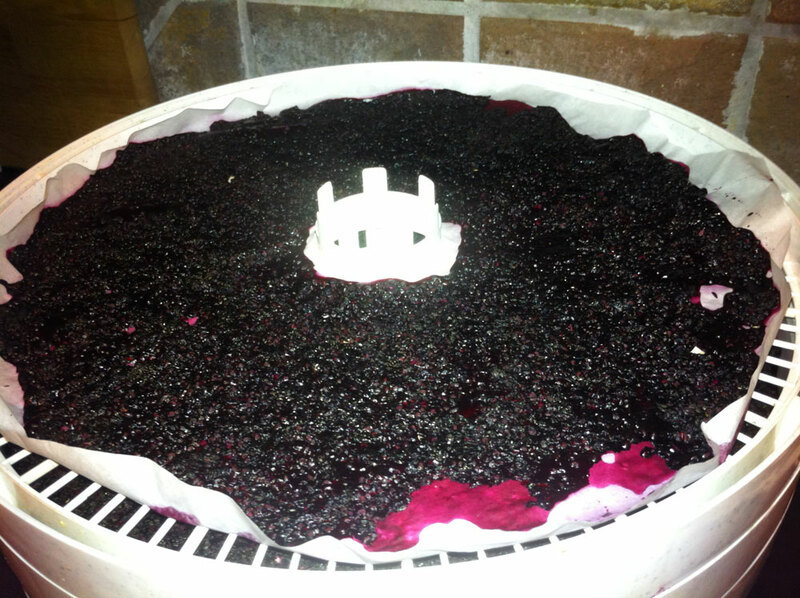 We have a bumper crop of just about everything I like to eat–black raspberry, blueberry, apple, cherry, etc. After work each day, I’m rushing out to harvest, harvest, harvest! And then I come home and preserve, preserve, preserve! But I’ll try to sneak a few blog posts in :). The fruit leather sounds awesome, as I would like to have a way to preserve berries that’s less energy intensive than freezing or canning. Would it work with blackberries? How about cranberries? Karen, my friend who has done it more often than me tells me that it works with most fruit. I’m sure it would work with blackberries, as they are so similar to raspberries. He’s also done it most frequently with autumn olives (which I’ll be posting about a bit later in the season!) I haven’t tried cranberries, but do try it and let me know how it works. You should also consider experimenting with straining vs. not straining :). Update–I did finally try making blackberry fruit leather. Since blackberries are more seedy than raspberries, I thought I should strain them. I got a thin juice with no pulp, so I never thought the drying process would work. But it did! The downside is that I lost a lot of volume by removing the seeds and pulp. (The first time, I didn’t cook long enough; the second effort was somewhat better.) These weren’t the best quality blackberries either, as most of my crop dried up. The leather is in a jar as you suggested, and I’m interested to see how long it will keep. Also plan to try it with cranberries as we have a great location where we can get them by the bucket. I don’t think it will be necessary to strain. This looks delicious! I’ll definitely have to try this next time I get my hands on an abundance of berries. One of my favorite forage crops too…this year I gathered a bunch at a new raspberry patch I found at the local metro park. For the final harvest, I knew I had to go within a certain time frame…which happened to be a day it was pouring rain. I suited up and went harvesting anyway, because nothing is so lovely as fresh wild black raspberries with homemade whipped cream. I find black raspberries in every park I visit, but I have never happened upon the elusive red raspberry/regular blackberry. Are they much harder to find? I have found red raspberry in South-East Michigan, but they are much more rare. 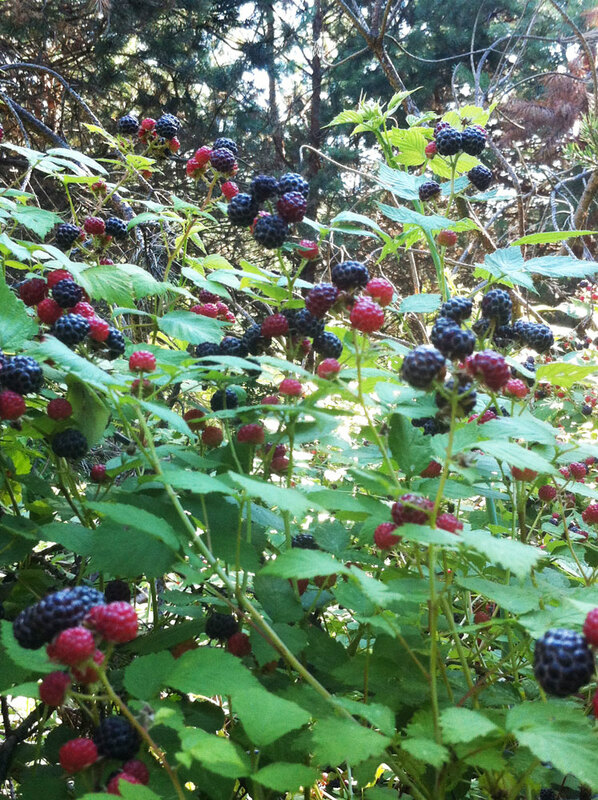 I have probably 40-50 black raspberry bushes in my yard, and maybe 4-6 red raspberry bushes (and not all of them fruit), and probably another 40-50 black berry bushes (they are also quite abundant). The red raspberry fruit, even this year, isn’t very plump. I’m not sure what cultivars the commercial growers are getting, but they aren’t what’s in the wild. The red raspberry bushes also have TONS more thorns around their canes, so that’s one way to tell the difference. Blackberries are different still–they are often found in the same spot, but they fruit a few weeks later. Right now, you’ll see their bushes as a dark red/green (no white residue on the canes); larger than the black raspberry. And the fruit will be green right now, with maybe a little bit of red starting on the tips. They are as abundant as black raspberries in SE Michigan. Where I grew up in South-Western PA, I found that blackberries were much more abundant than black raspberries or red raspberries. Not everyone knows the difference between blackberry and black raspberry, but the easiest way to tell is with the fruit–the black raspberry has a hollow inside, where you pull the berry from the stem. The black raspberry is solid. They also have quite different flavor. All of the three discussed here are found in the same kind of spaces–the edges between the forest and the fields, usually. Glad to see the definition of black raspberry and blackberry. I’ve always been confused. 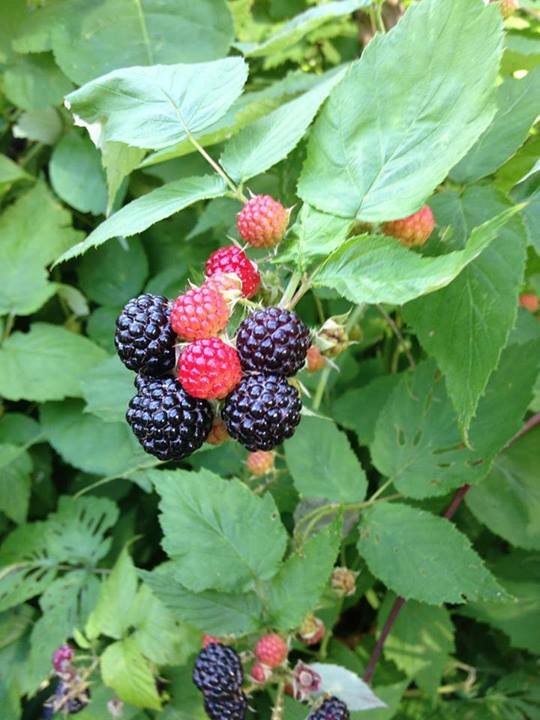 I have what I think are black raspberries in my yard–when I pick them, they pick like red raspberries–hollow inside. They are small. But aren’t there other berries that could resemble this–dewberries, thimbleberries etc.? Any advice on how I can know what I actually have in my yard?? What I have is incredibly delicious and sweet if that helps. Smaller than red raspberries, bush is very thorny. Jazz – yep, the red raspberry is very, very thorny. But I’m not sure about dewberries and thimbleberries–I’m not sure if these are derivations of the same name or not. Do you have a photo to share? If so, you can email it to adriayna@yahoo.com and I can take a look. In the meantime, I will see if I can do more research on those other terms :). I’m really just trying to identify what I find growing here! Oh man! Love the blog. I’m about to embark on a crosscountry trip and being a broke grad student, I’ve been picking berries all season long and am going to make fruit leather for a healthy, cheap, easy snack along the way. As a side note, I’m also originally from the Metro Detroit area, but am about to leave Pennsylvania where I’ve been living for three years. Good to see someone from Metro Detroit with an active, informative, beautiful, photo-rich blog! I am envious of those chicken of the woods!